Having no more than just a few successes to show in the 55 years they competed in former Soviet Union's Championship and Cup, Shakhtar had a shaky start in life in independent Ukraine, but after a dramatic change in leadership in 1995, they rapidly managed to transform themselves from a just average team, into a true powerhouse at national level, and a highly-regarded one internationally. Stakhanovets, as was the club's initial name when they were founded in 1936, had their first successes in the early sixties, when, having long ago changed their name to Shakhtar (Shakhter in Russian, and pronounced Shakhtyor, in the mostly Russian-speaking Donbass Region), they won the Soviet Cup two years in a row, 1961 and 1962. They had to wait almost two decades to add more silverware to their modest collection, winning two more Soviet Cups in 1980 and 1983. Those, along with some decent runs in the Soviet Championship, were all they had to show in the five and a half decades they participated in former USSR competitions. The first half of the nineties was the beginning of a new era for independent Ukraine, but not a particularly successful one for Shakhtar. They struggled to finish higher than fourth in the newly established Ukrainian Premier League, and only had a Ukrainian Cup in 1995 as a consolation prize. The club's fortunes were meant to start changing after a highly unusual, as well as dramatic event. In October 1995, then-president Akhat Bragin was brutally assassinated in a bomb explosion during a Championship game. Five more people died (mostly Bragin's associates who were watching the game alongside him in the VIP Box of Shakhtar Stadium), several others were injured. Once the dust settled, Shakhtar had a new man in charge, the one who was meant to lead them to unprecedented glory. 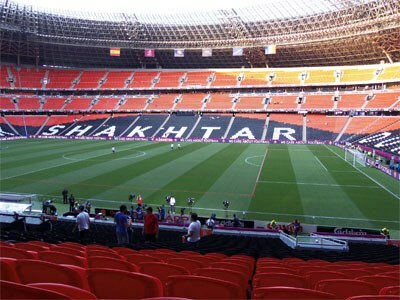 Under Rinat Akhmetov (only 29 when he took over), Shakhtar spent a few years establishing themselves as a serious and consistent title contender, and in 2002 their decades-long wait came to an end. The national Championship they won, was the first of many to follow, especially after Mircea Lucescu took over as head coach in 2004. Playing a very pleasing to the eye type of football, combining mostly local defenders and Brazilian midfielders and attackers, Shakhtar reached previously unimaginable heights, with their 2009 UEFA Cup conquest as cherry on top, becoming only the second Ukrainian team to win an international title. 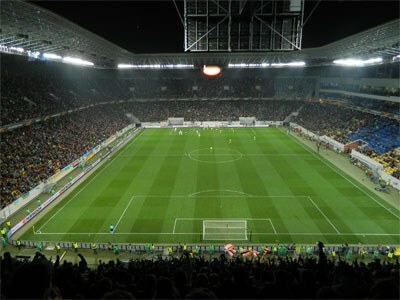 UEFA Europa League quarter-final against Braga at Arena Lviv in 2016. The war in east Ukraine did not leave Shakhtar unscathed. Forced to self-exile from their spectacular Donbass Arena in 2014, the “Pitmen” (coal miners) found temporary refuge elsewhere in the country, with remarkable ups and downs in their on-field performance. As long as Akhmetov keeps financing the club though, they look safe to continue winning titles, while at the same time dreaming of returning to Donetsk. Today's logo that has been in use since 2007, is the first to have Shakhtar's name in Ukrainian, instead of Russian, and the first to combine the two crossed hammers (a sixties' touch) with elements of a ball (at the top) and a pitch (first used in 1989).